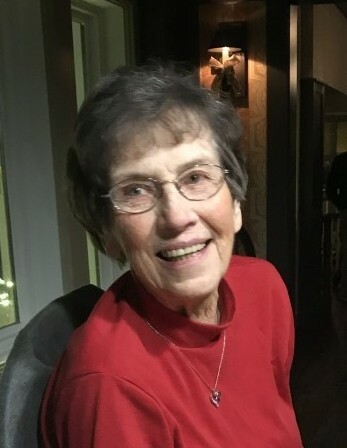 Obituary for Beverly Jane (Jones) Madison | Timothy A. Berkebile Funeral Home Inc.
Beverly Jane Madison 90, of Everett, died Monday, April 15, 2019 at Pennknoll Village Nursing Home. She was born on July 27, 1928 in Annapolis, MD a daughter of the late Bernard and Margaret (Gladys) Jones. She met her husband of 70 years, Robert L. Madison, at the U.S Naval Academy, and on December 18, 1948 in Annapolis, MD they were united in marriage. In addition to her husband she is survived by the following family: a daughter, Karen Madison Smith and husband Tony, of Staunton, VA, two sons: Robert Michael Madison, and wife Elaine, of Clearville, and Mark Allen Madison and companion, Andrea Sickles, of Centreville, MD; six grandchildren: Patrick Torrens and wife Sarah, Katie Fritts and husband Kyle, Morgan Madison Takah and husband Thomas, Benjamin Madison, Sean Madison, and Liam Madison; and four great-grandchildren: Madison and Jacob Fritts, Oliver and Samuel Torrens. She was preceded in death by her darling sister, Vivian Lee Jones in 1933. Beverly worked for the Ann Arundel County Board of Education as a teacher’s aid, helping with handicap children. She enjoyed being with her family, and spending time with all her grandchildren.